Barcode Input options specify the device hardware to use for scanning and the decoders to be applied on the acquired data before sending it for processing. Decoders included with DataWedge are explained below. DataWedge also provides audio and other feedback to alert the user of scanning results and barcode type. See the Scanner Parameters section for more information. If using SimulScan, see SimulScan Input profile guide. Barcode Scanner Input reads data from the integrated barcode scanner built into the device, or attached via cable or Bluetooth connection, or implemented as a snap-on module. DataWedge supports lasers, imagers and internal cameras. The raw barcode data that's acquired is processed or formatted as using the Basic and Advanced Data Formatting Processing options that are found near the Output options. Note: When SimulScan is used, DataWedge concatenates all captured text into a single string, and performs processing on the concatenated string. See the SimulScan section for details. For Barcode Input, the Scanner selection panel determines which scanning device will be used for data capture. The list of available scanners is based on devices present in (or connected to) the unit being configured. The "Auto" option automatically determines the best scanning device from the list of available devices based on the rules below. If a Zebra Scan Module or Scan/MSR Module is installed, the 2D imager is selected. If no Scan Module is installed, the camera is selected. After initial configuration, a Bluetooth scanner can be enabled and disabled in the Profile, even if it is disconnected from the device. 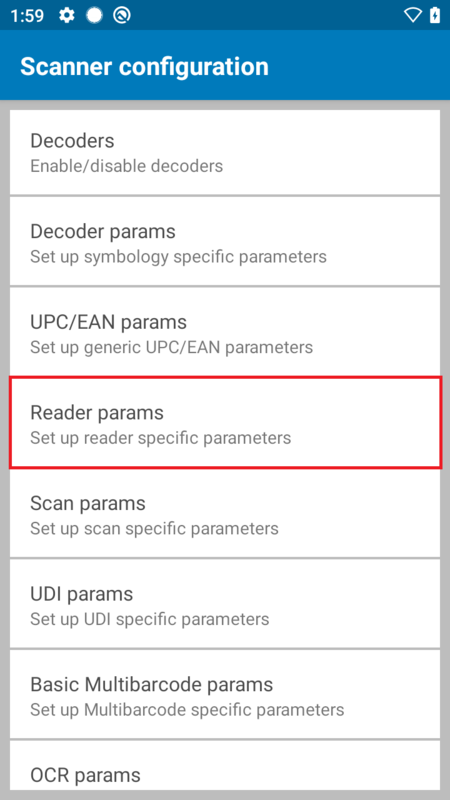 However, to configure decoders, reader parameters and other scanner settings, a Bluetooth scanner must be connected. 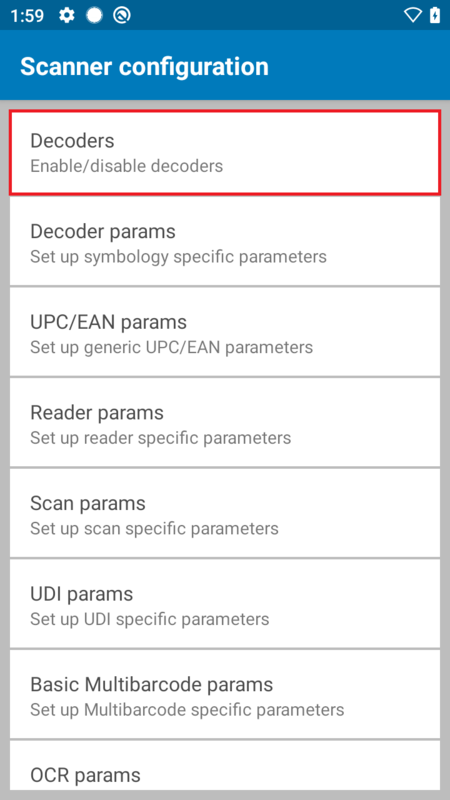 DataWedge does not automatically reconnect to a Bluetooth scanner if that scanner is connected while DataWedge is using a different auto-selected scanner. To re-enable a Bluetooth scanner, connect the scanner and select it in the Profile or re-choose the "Auto" selection option. Auto-selection and Battery Swap - If Scanner selection is set to Auto and an RS507 was enabled prior to a battery swap, DataWedge continues working with that RS507 scanner upon reconnection after a battery is swapped. If the RS507 does not reconnect after the swap, DataWedge reverts to the current default scanner. Keep Enabled on Suspend - This mode is supported on Bluetooth and pluggable scanners, and might result in faster battery drain than would otherwise be expected while in suspend mode. Note: The Zebra computing device wakes from suspend mode when pressing the scan trigger of any supported scanner. This feature configures DataWedge to select an external scanner as the default scanning device immediately upon connection and revert to a built-in scanner when the external scanner is disconnected. External scanners include those connecting by Bluetooth, serial cable or snap-on module. Disabled by default. Available only when “Auto" is selected in the Scanner selection panel. This feature is intended to help reduce scanning workflow interruptions when a Bluetooth scanner is introduced and/or it becomes disconnected by losing power or moving out of range. 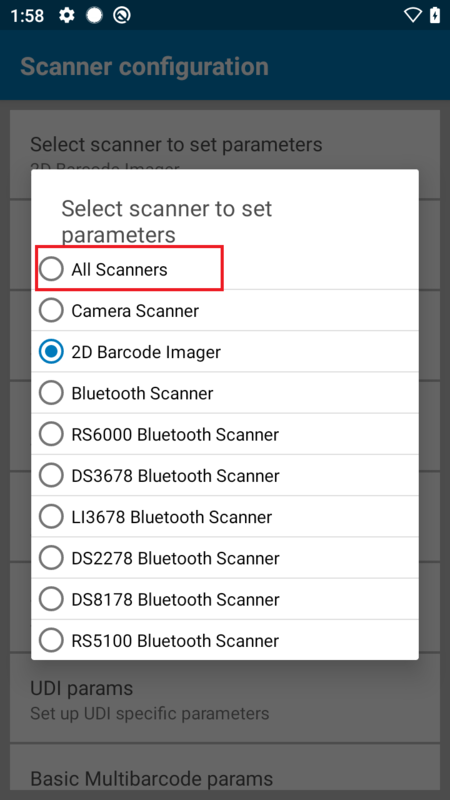 For Bluetooth scanners, if the device was not previously paired, a pairing barcode is displayed prior to automatic connection. "Auto switch to default on event" is available only when "Auto" is selected. Disabled - No scanner switching occurs when an external scanner is connected or disconnected (default). On connect - Selects the external scanner as the default scanning device immediately upon connection. On disconnect - Reverts to a built-in scanner based on its position in an internally managed scanner list (which varies by host device). This is usually the scanner most recently used prior to the external connection (see notes below). On connect/disconnect - Selects an external scanner as the default scanning device immediately upon connection. Upon disconnection, reverts to the scanner set as the default prior to the external connection. The system selects the default scanner based on the connection state and the scanner's position in an internally managed scanner list. If the newly connected scanner is lower in the scanner list than the one currently selected as the default scanner, the newly connected scanner becomes the default scanner. On devices with only one built-in scanner or imager, "On disconnect" reverts to that built-in scanner or imager. Global scanner configuration allows users to specify a generic scanner configuration applicable for all supported scanners. Rather than specifying multiple individual configurations for each separate scanner within a given DataWedge profile, the global configuration setting is provided to configure multiple scanners in a single profile. Global scanner configuration displays all scanner parameters and values for each and every scanner even if not supported by a specific scanner. Since this list is all-inclusive, there is a possibility a particular parameter or value may not be supported on an individual scanner. In this case, an error is logged in logcat during scanning. 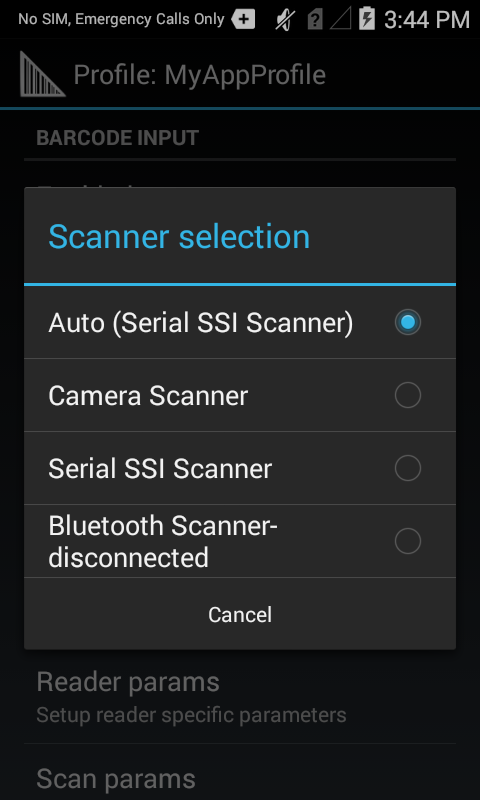 When global scanner configuration is enabled, access is still available to settings specific to individual scanners, such as the option “Keep enabled on suspend” (which specifically applies to Bluetooth and other peripheral scanners), even if the default scanner is selected as an internal scanner for “Scanner Selection” (See Figure 1). When applying configurations, if any of the global settings are not applicable to the specific scanner, those settings cannot apply and will be disregarded. The global configuration is applied. The specific scanner configuration is applied. If reports are generated when the global scanner configuration is set, the values supported by the connected device will be returned. Open a profile in DataWedge. The "Barcode input" section contains the option "Configure scanner settings". Note: The “Configure scanner settings” option is still accessible even when the selected scanner in “Scanner Selection” is disconnected. In previous DataWedge versions prior to 6.8, all the scanner parameters (decoders, decoder params, etc.) are grayed-out and inaccessible. 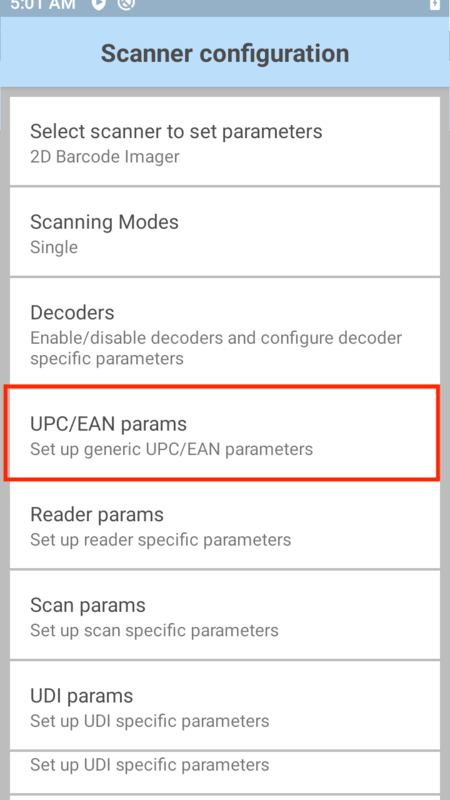 Tap "Configure scanner settings". A list of scanner configuration settings appears. 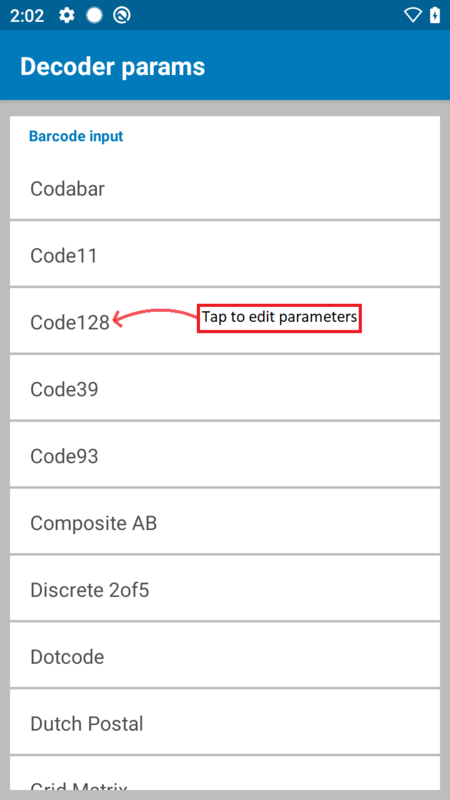 Tap "Select scanner to set parameters". 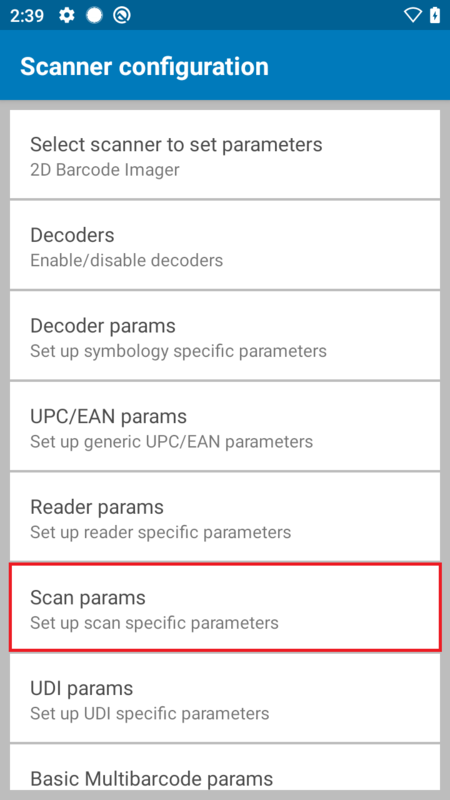 All Scanners option is available to allow the scanner settings to apply to all scanners. Select All Scanners. A confirmation message appears indicating that any setting changes moving forward will be applicable to all scanners as a common global configuration. Any existing individual scanner setting will be replaced by this global setting. The scanner does not need to be connected to the device in order to configure the settings in the global scanner configuration. Set the global scanner configuration by setting the value of parameter configure_all_scanners to "true" via SET_CONFIG intent API. Many input methods include parameters that are configurable according to the expected scan targets and/or preferences of an organization. Enabling a narrow selection of decoders can help increase security, reduce decode errors and improve scan performance. For example, a company that routinely receives packages encoded with Code 128 symbology might consider limiting the Code 128 decoders it implements to those of the non-EAN variety. Parameters for individual Decoders are modified within a Profile. Each DataWedge Profile can be assigned a unique group of Decoders and Decoder parameters (where applicable) to use with its associated application(s). This guide covers the selection of Decoders and provides details for those with configurable parameters. DataWedge decodes all major barcode symbologies. Popular formats are enabled by default in all DataWedge Profiles (indicated by an *). 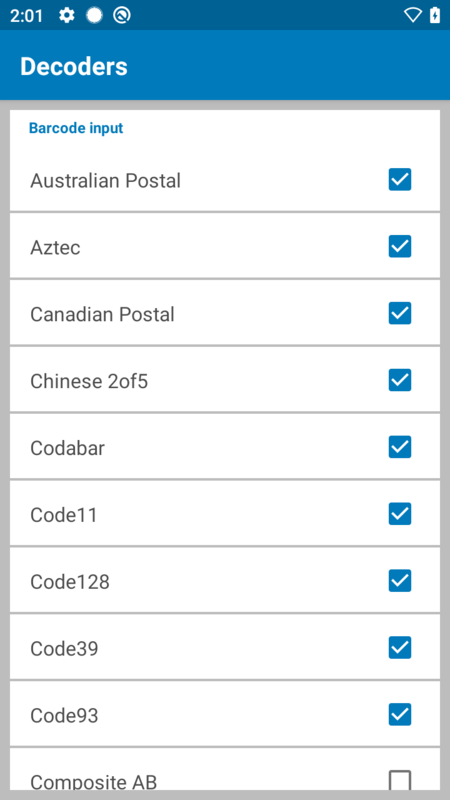 To improve scanning performance, Zebra recommends disabling all Decoders not required by the app(s) associated with a given Profile. Note: Decoders lacking configurable parameters do not appear in the Decoder Parameters section. Others are linked to their corresponding parameter descriptions. Note: Hyperlinked decoders indicate (and link to) configurable parameters. 1. From the Profile being edited, tap Decoders as highlighted below. A list of Decoders appears similar to the image in Step 2. 2. Select/deselect the desired Decoders by checking/unchecking the corresponding checkbox. Note: Reducing nonessential Decoders can improve scanning performance. 1. From the Profile being edited, tap Decoder params as highlighted below. A list of Decoders appears similar to the image in Step 2, below. Editable parameters of individual Decoders are explained below. Note: Decoders lacking configurable parameters do not appear in the Decoder Parameters section below. For further instructions about creating and editing DataWedge Profiles, see "Manage Profiles" guide. The quiet zone is the blank space on either side of a bar code that indicates where the symbology begins and ends, and is intended to prevent the reader from scanning irrelevant information. When marginless decoders are used with Reduced Quiet Zone Level reader parameters, the decoders behave according to the following table: Descriptions of the 1D Quiet Zone Levels shown above are in the Reader Params section along with important warnings. 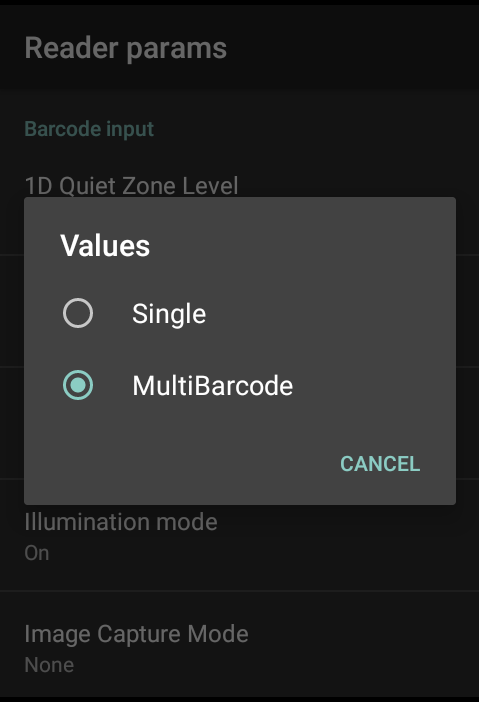 Disabled (0) - To decode DotCode barcodes with normal reflectance only. 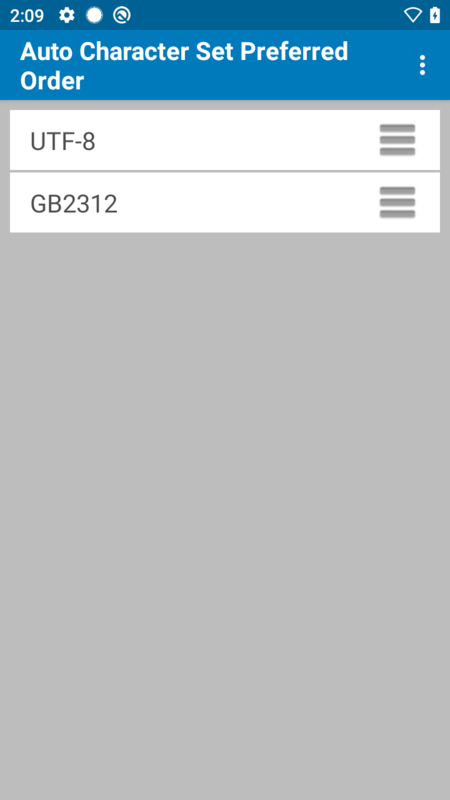 Enabled (1) - To decode DotCode barcodes with inverse reflectance only. Auto (2) - To decode both normal and inverse reflectance DotCode barcodes (default). Disabled (0) - To decode non-mirrored DotCode barcodes only. Enabled (1) - To decode mirrored DotCode barcodes only. Auto (2) - To decode both mirrored and non-mirrored DotCode barcodes (default). Enable EAN128 - Set the EAN128 subtype. A check in the checkbox indicates that the option is enabled for this label type. "●" indicates enabled. "o" indicates disabled. The blue shaded row indicates a successful decode for label types reported as Datamatrix although GS1 Datamatrix is disabled. The blue shaded row indicates a successful decode for label types reported as QR Code although GS1 QR Code is disabled. Length1* - Used to set decode length. Length2* - Used to set decode length. Report Check Digit - Transmit Matrix 2of5 data with or without the check digit. Verify Check Digit - Enable this feature to check the integrity of all Matrix 2of5 symbols to verify that the data complies with a specified check digit algorithm. Retry Count - Retry count for auto-discriminating for supplementals. Possible values are 2 to 20. Note that this flag is only considered if Supplemental Mode is set to one of the following values: Supplementals Auto, Supplementals Smart, Supplementals 378-379, Supplementals 978-979, Supplementals 977 or Supplementals 414-419-434-439 (2 to 20). Note: Higher marginless levels will increase decoding times and the risk of decoding errors. Zebra recommends enabling only the symbologies that require a higher marginless level and leaving all other symbologies at the default level of 1. Presentation - For future use only. Automatically activates the scanner and starts scanning immediately when a barcode is presented in its field of view, without any trigger press. Press and Sustain - Starts the scan beam when the trigger is pressed and continues the decode session until the Beam Timer is expired, barcode is decoded or read is canceled. Scan beam is not stopped when the trigger is released. This avoids unexpected cancellations of a read by subsequently pressing the trigger button of the device; subsequent trigger presses while the beam is ON have no effect. Applies to internal imager on TC20/TC25 and RS6000/RS507 Bluetooth scanners connected to TC57/TC77 and PS20 devices. Note: Zebra does not recommend changing the Image Capture Mode parameter when DataWedge is used to scan barcodes; DataWedge does not process image data. LCD Mode - Used to Enable/Disable LCD Mode, which enhances the ability of the imager to read barcodes from LCD displays such as cellphones (applies to Scan Module only). Use of LCD mode might lead to performance degradation and a blinking reticle prior to decoding. Performance might vary on some devices if Hardware or Software Picklist modes are set. If using Multi-barcode mode, see important behavior notes below. Effort Level 1 - The scanner performance on regular 2D barcodes is impacted while decoding performance on Tesco Thailand barcode and Suppository barcode is improved. Different Symbol Timeout - Used to prevent the scanner from decoding another symbol within a specified time interval (applicable only when Aim Type is set to Continuous Read). A value of 0 indicates that no interval is required between two successive reads. Same Symbol Timeout - Used to prevent the scanner from decoding the same symbol within a specified time interval (applicable only when Aim Type is set to Continuous Read). A value of 0 indicates that no interval is required between two successive reads. Digimarc Decoding - Used to enable/disable support for Digimarc, which encodes and invisibly integrates traditional barcode data onto product packaging. Supported with internal imager only. Enabled by default. More about Digimarc. Scanning Modes - Used to select between Single (normal), UDI and Multi-barcode modes. 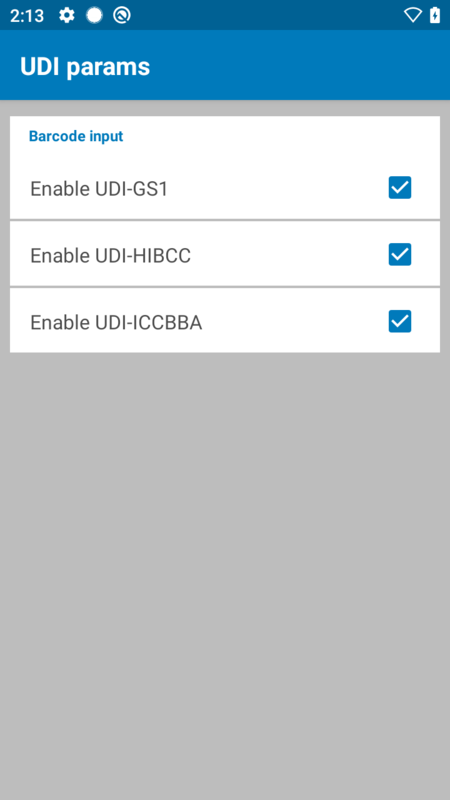 UDI mode acquires multiple simultaneous inputs as specified in the selected Universal Device Identifier UDI parameter(s). Multi-barcode mode acquires from 2-10 barcodes with each scan as specified in the Multi-barcode params panel. Default=5. Zoom - Required for decoding DotCode barcodes. User needs to set Camera Zoom value to 2 on the following devices: MC33, TC51/TC56, TC70x/TC75x, VC80x, TC52/TC57, TC72/TC77, PS20. If Camera Zoom is set to any value other than 2 on these devices, it can negatively impact the decoding of specific DotCode barcodes. Parameter values: 1 - 8. Default=1. Keep Pairing Info After Reboot - Enable/disable automatic re-connection to the connected Bluetooth scanner after device reboot. Applies only to connected Bluetooth scanners. The Universal Device Identifier (UDI) parameter acquires multiple barcodes simultaneously. 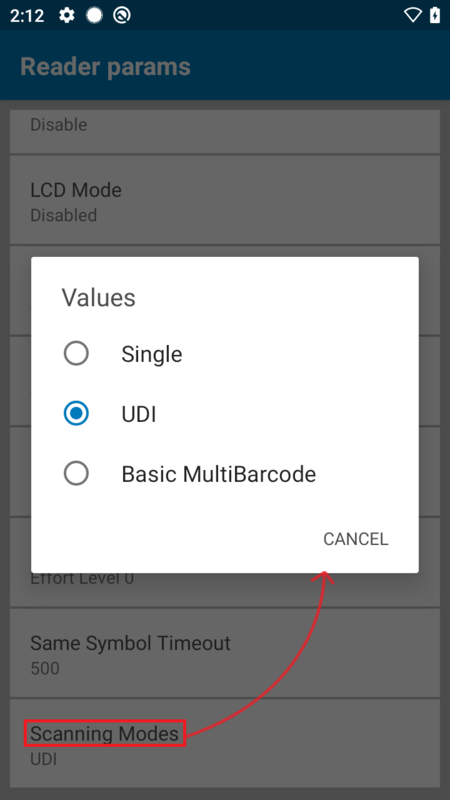 When UDI scanning mode is enabled (as above)... ...the selected UDI input parameter(s) will be used. 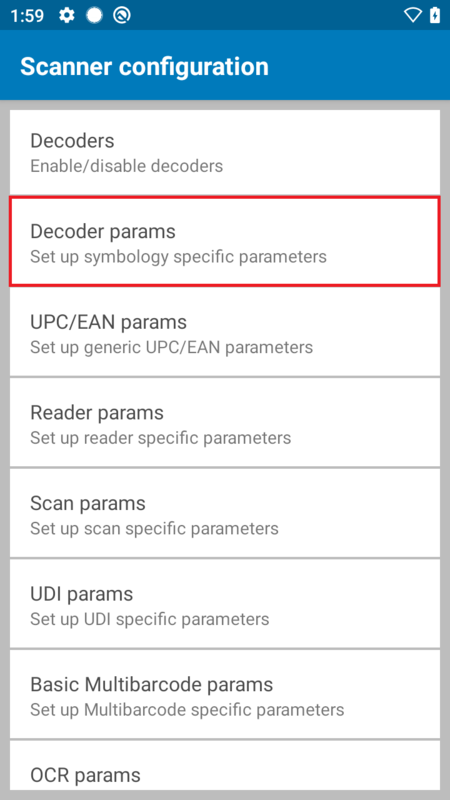 UDI decoding is supported only on the devices listed above. Output of collected UDI data might require settings adjustments of the token-separation character and/or output order. See the Keystroke Output guide guide for more information. UDI settings can vary by geographic region. See the relevant sections of Keystroke Output, Intent Output and/or IP Output guides for more information. 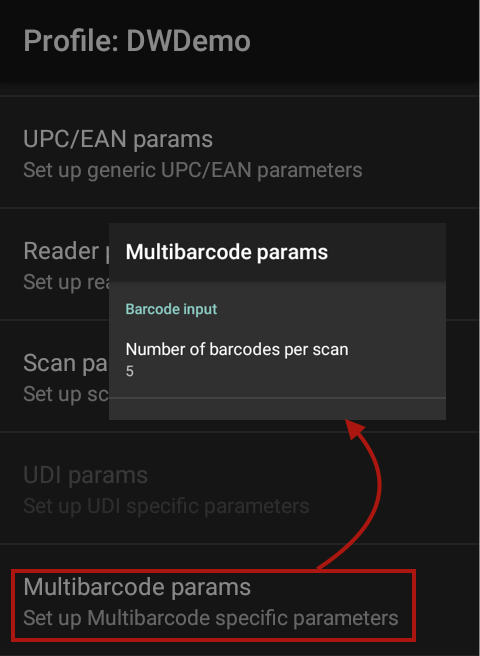 When Multi-barcode scanning mode is enabled (as above)... ...specify the number of barcodes to be decoded with each scan. Supported with internal imager on TC20/TC25 devices only. Acquired data from all barcodes is delivered as a single string when output as keystrokes. To add separators and adjust output order, see the Keystroke Output guide. Picklist behavior - If the Picklist parameter is set to “Disabled,” the device will attempt to scan the number of barcodes (from 2-10) specified in the Multi-barcode params panel. If the Picklist parameter is set to a value other than “Disabled," the user is expected to move the cross-hair to each barcode to be scanned. Data is returned only after the specified number of barcodes is read. Duplicate barcodes - If a label to be scanned contains multiple barcodes, some of which are duplicates (with the same label type and data), only one barcode from the duplicates is decoded; the remainder are ignored. If the label has two duplicate barcodes plus another two different barcodes, a maximum of three barcodes will be decoded from that form; one will be ignored as a duplicate. Multiple barcode types - Barcodes can be of multiple label types and still be acquired together. For example, if the specified quantity for a Multi-barcode scan is four, two barcodes can be label type Code 128 and the other two can be type Code 39. Barcodes in view -If the specified number of barcodes is not initially in view of the scanner, the scanner will not decode any data. If the scanner's field of view contains a number of barcodes greater than the specified quantity, the scanner will randomly decode barcode(s) until the specified number is reached. For example, if the count is set to two and eight barcodes are in the field of view, the scanner will decode the first two barcodes it sees, returning the data in random order. Data is returned only after the specified number of barcodes is read. 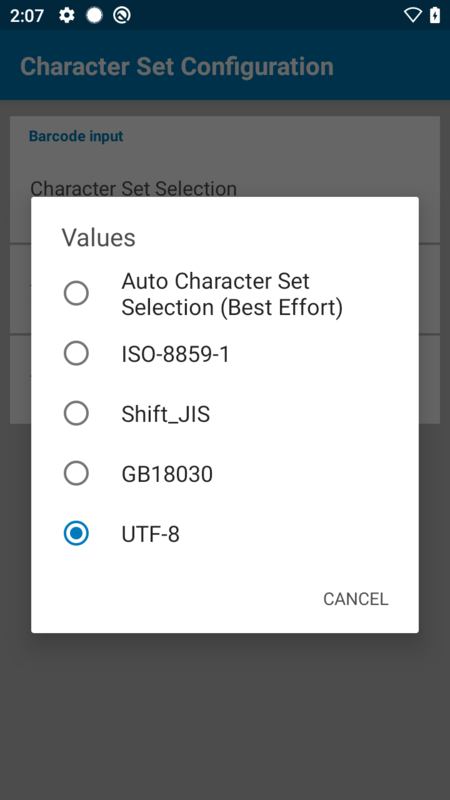 Character Set Selection - Converts the barcode data to the specified encoding type if different from the default encoding type, UTF-8. Other options are: Auto Character Set Selection, ISO-8859-1, Shift_JIS and GB18030. Auto Character Set Selection (Best Effort) - Decodes data in the preference order of character sets specified in the "Auto Character Set Preferred Order" list. If the data cannot be decoded based on the character sets listed, "Auto Character Set Failure Option" takes into effect. See description for each respective option for more details. Auto Character Set Preferred Order - If "Auto Character Set Selection (Best Effort)" is selected, decodes data in the specified preference order of listed character sets. This is useful in cases where data can be decoded from more than one character set. The first character set listed which can decode the data successfully is chosen to decode the data - any other character set located lower in the list is not considered, even if the data could be successfully decoded using that character set. If DataWedge cannot find a character set from the preferred list to decode the data successfully, the character set selected in "Auto Character Set Failure Option" is used to decode the data. Both the preferred character set list and its preference order is configurable. The order is rearranged by dragging the “hamburger-like” icon of the character set into the desired position. To delete a character set, long press on the item and the “Delete” option appears. 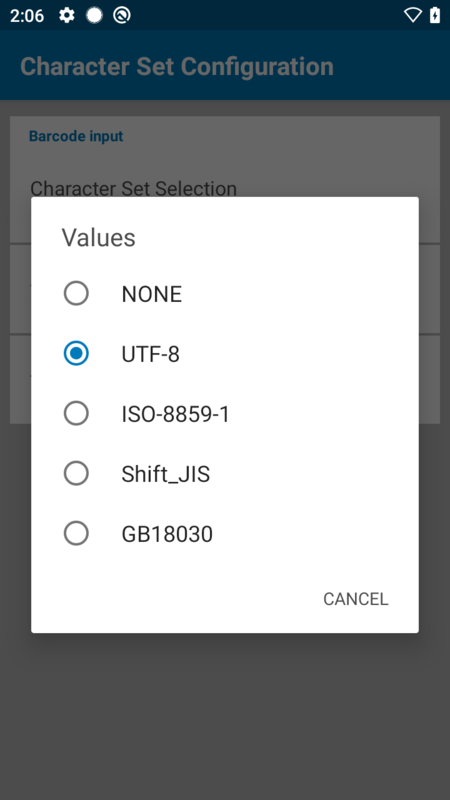 To add a new character set, tap the “hamburger” menu at top right corner - an option to add characters sets, such as UTF-8 and GB2312, will appear. 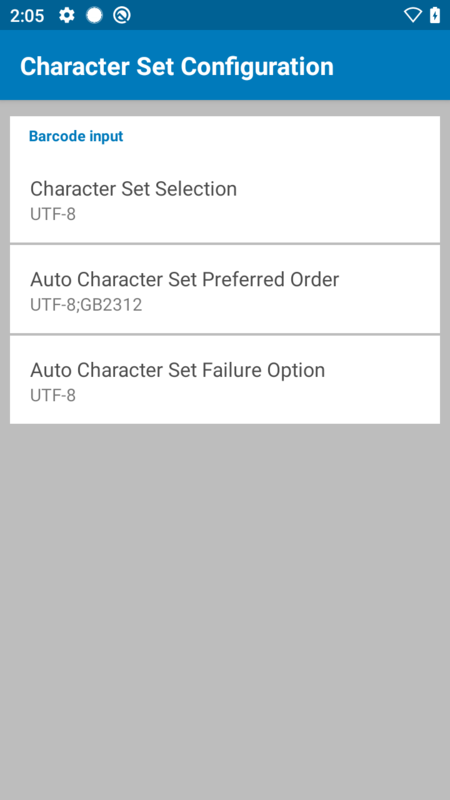 Auto Character Set Failure Option - Used to decode data if the device cannot successfully decode based on the character sets listed in the "Auto Character Set Preferred Order" list. If “None” is selected, “Null” is returned as the data string. Decode Screen Notification - When enabled, a translucent green screen overlay appears for 1 second upon every successful decode. Decode Screen Notification Timer - Defines the length of time (in milliseconds) to display the screen notification upon successful decode. Timer configuration range is 500 ms to 1500 ms. Default time is 1000 ms.
Decode Screen Translucency Level - Sets the translucency of the decode notification green screen. Translucency level range is 20 to 50, in increments of 5. The higher the value, the more the translucency (visibility). Ringer - Uses Ringer volume setting for audio feedback. Notification - Uses Notification volume setting for audio feedback.